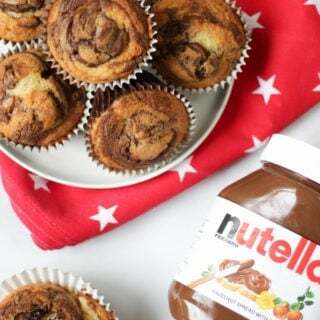 Easy Nutella Muffins recipe – These Nutella muffins are super easy to make, a basic cake mixture with the delicious addition of a spoonful of Nutella. A really simple and delicious chocolate cupcake, perfect for baking with children or for after school snacks. Beat in the eggs one at a time, don't worry if it curdles slightly. Scoop the mixture into 12 cupcake liners in a muffin tray. Use a table knife to create a swirl, making sure that the majority of the Nutella is covered by cake batter.